On Halloween in 1998 Joachim Henn (aka no. 5 ) and Daniel Vujanic (aka no. 9 ) decided to play and record some music aside from their "full-time" bands "Ma Cherie For Painting" and "Stale". Some instruments and analogue recording devices (4-track) were set-up in a small section of a big, old shed full of seriously rehearsing heavy metal bands around the small "Thrash/Speed/Death-free zone". After this semi-legendary Halloween weekend session, the material for the first 7" inch E.P. was on tape. Consisting of guitardrones, ghostly keyboardlines, minimal drums and an improvised approach towards precisely composed music, "The High Life & Hard Times Of..." (Bonita Celestial Records) is a ride through dirty dynamics (side A) but also through melodic and quite tender moments (side B). 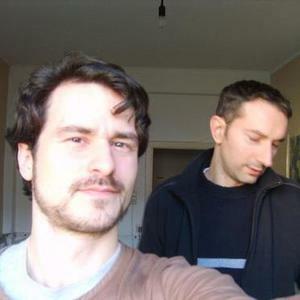 The duo recorded their first regular album called "Formate Heaven Syntax Hell" in 2001-02 and released it via the Australian label Saucerlike Recordings. The two album sides consist of two episodic, 20 min+ pieces, each one fusing psychedelia, noise, minimalism, folk, freejazz and krautrock with help from the mixing desk and occasional third bandmember/recording engineer Bach Vick. LP number two "Last Exit Wedding" was less analogue due to the extended use of laptop as a processing device but still full of the typical "sonic wanderlust" (tinymixtapes). It was recorded by Vujanic and Henn over the course of a couple of years, mixed by E Jugend and Bach Vick, who also did the mastering. The album was released in 2006-07 via Taping-Desk-O-Phon. A new album is in the making, maybe even in time for the 10 years of E Jugend anniversary.